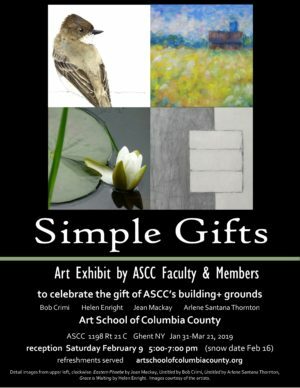 Join us as we reflect on gratitude, nature, and art in our upcoming exhibit “Simple Gifts.” Featuring the work of ASCC faculty members Jean Mackay and Arlene Santana Thornton, and ASCC members Bob Crimi and Helen Enright, the exhibit is on view in ASCC’s gallery until March 21. The opening reception to meet the artists is Saturday February 9 from 5-7 pm. The reception is free and open to the public, refreshments are served (snow date February 16). The exhibit celebrates the donation of ASCC’s historic schoolhouse building and reflects on the nature of gifts, gratitude, and the ever-present gift of inspiration in nature. We thank the community for the strong support you have shown shown for ASCC’s recent Capital Campaign to secure our home from donor Nicole Furnée. We are grateful for our HOME for ART – thank you. See you soon!